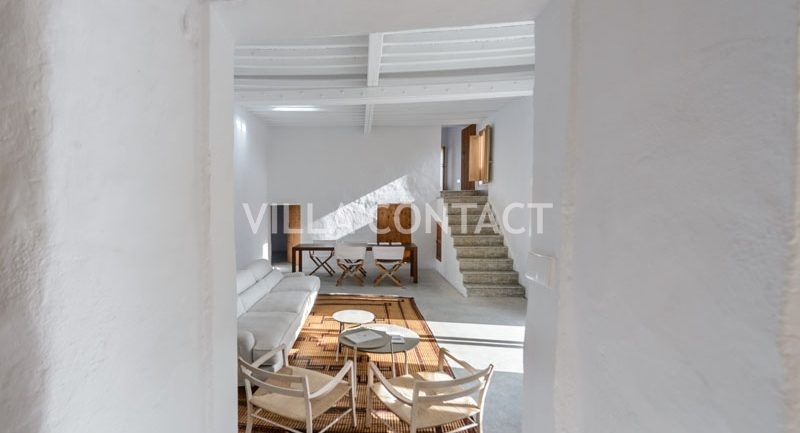 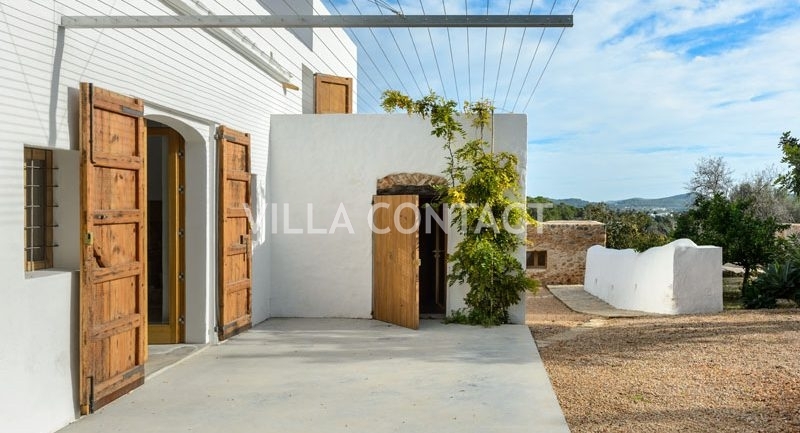 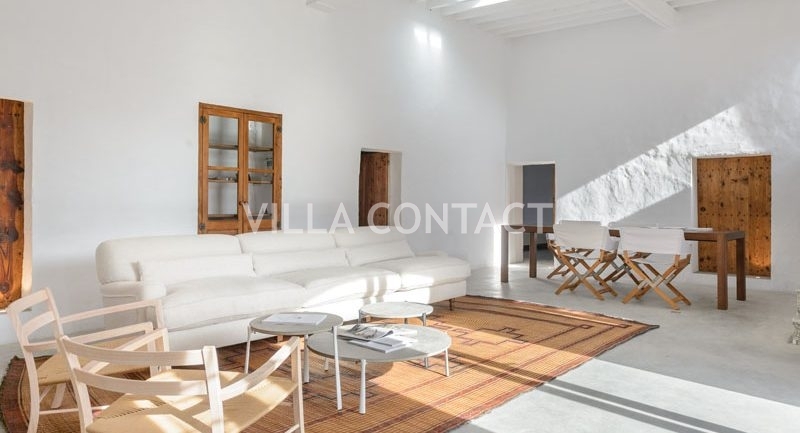 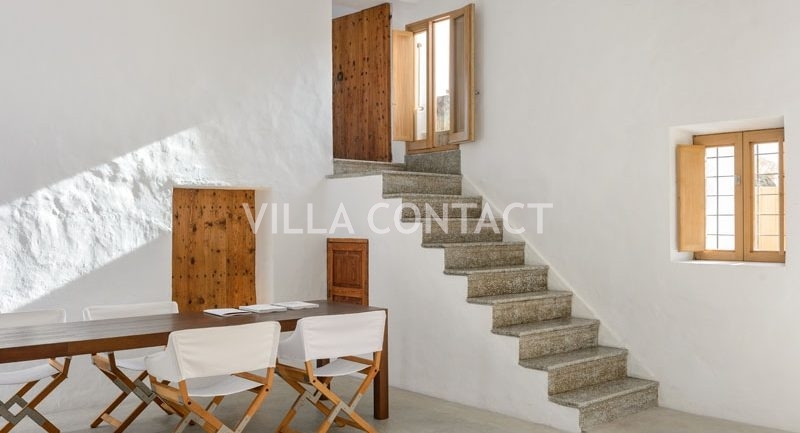 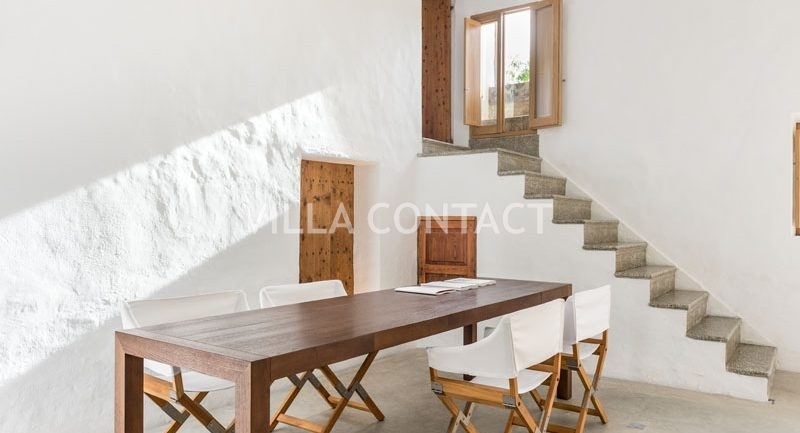 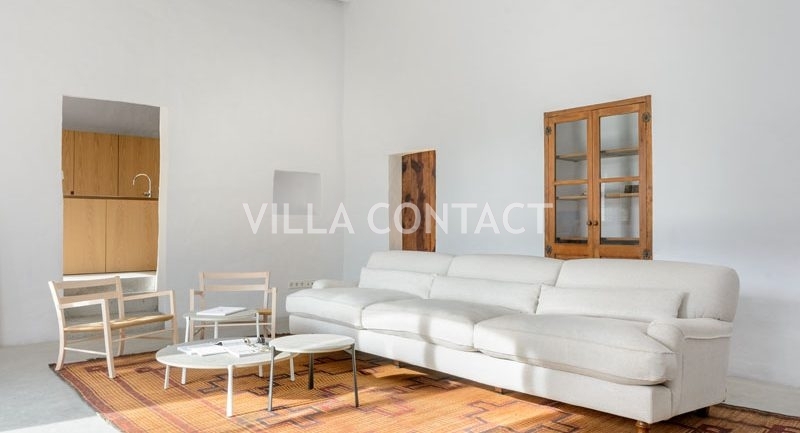 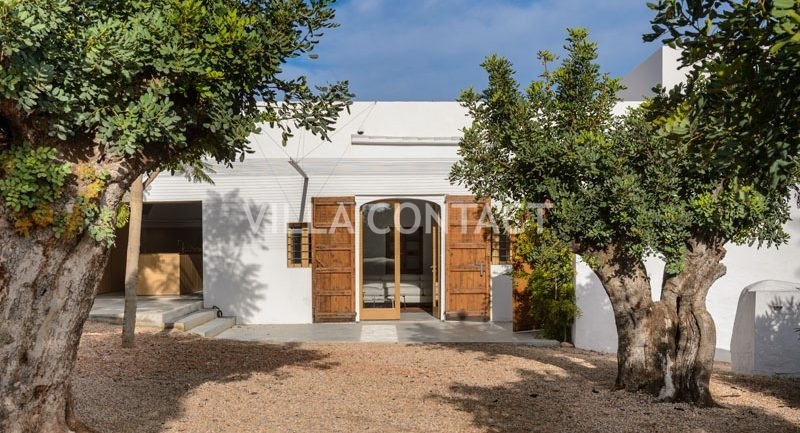 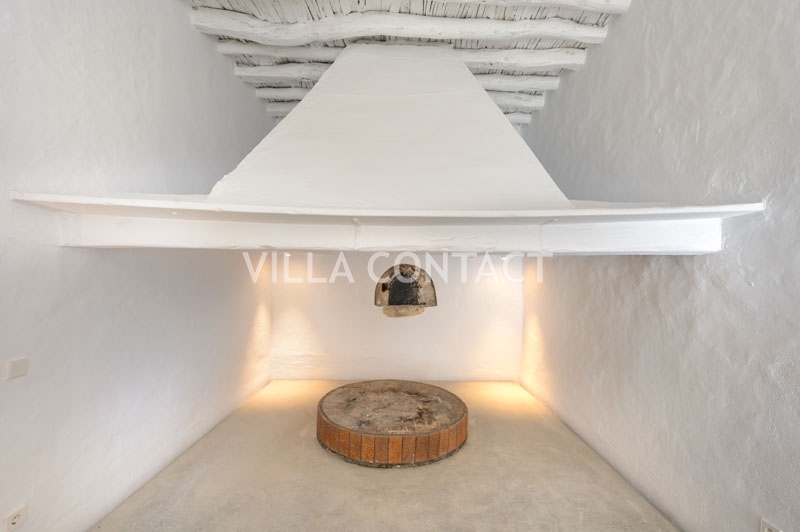 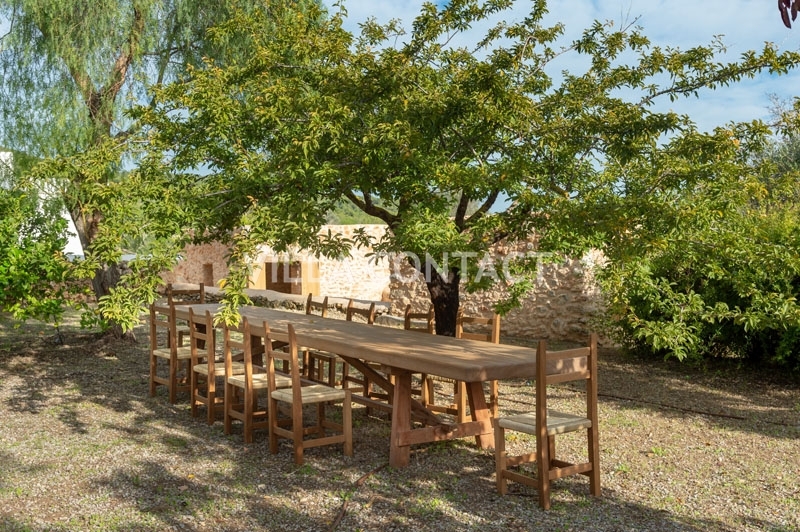 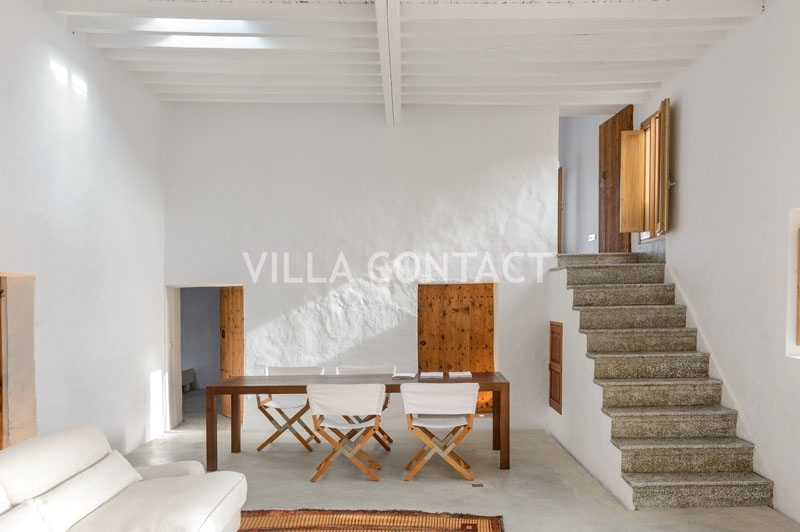 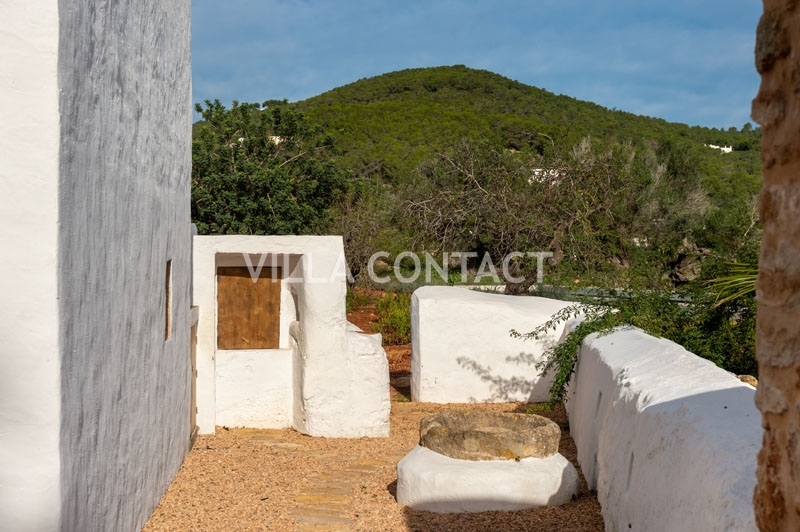 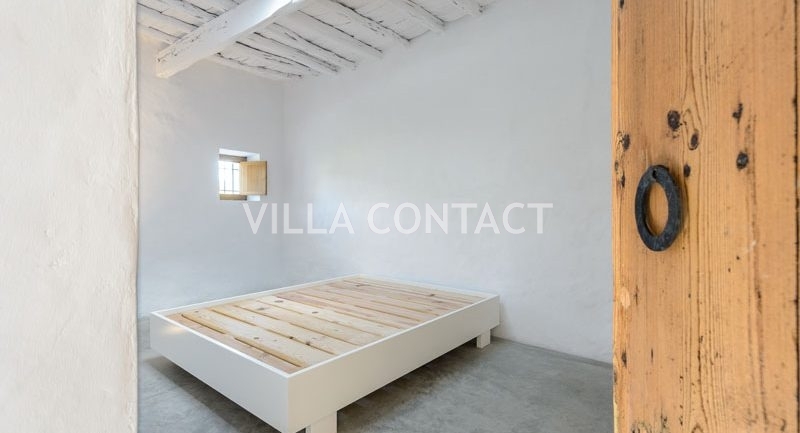 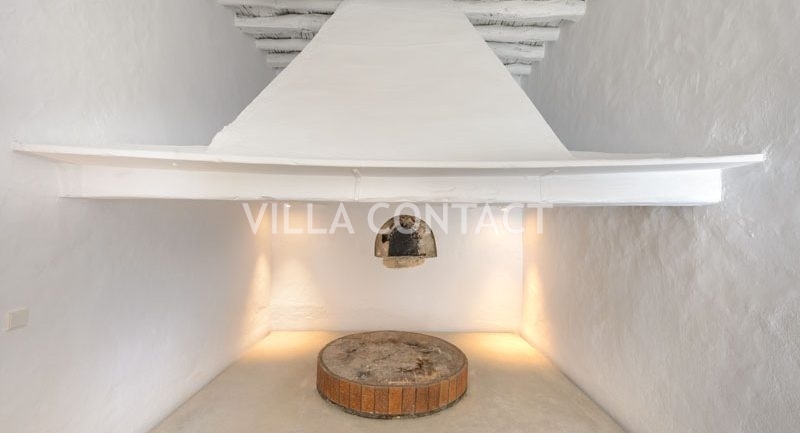 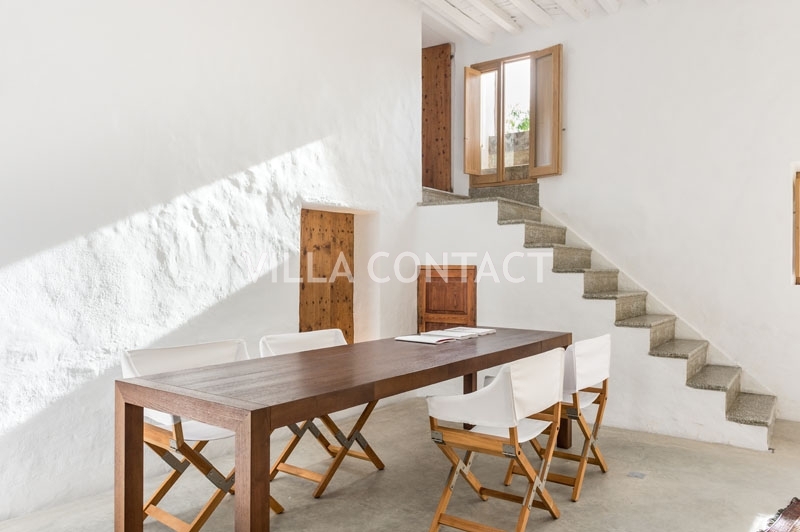 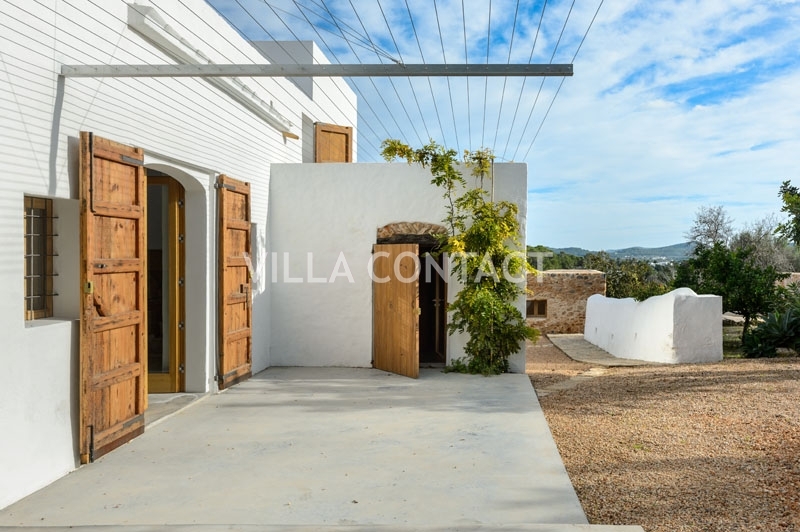 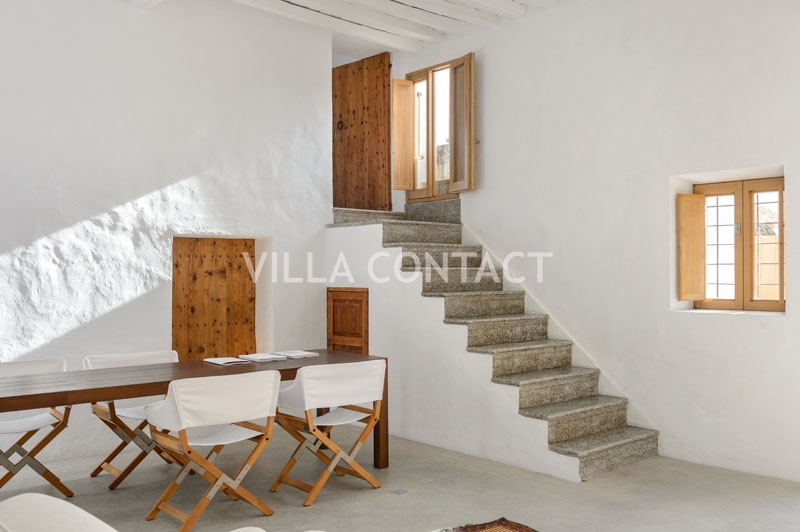 Can Palau, a 19th Century farm house usually called a “Finca Ibicenca” on the Island, has been completely renovated in order to integrate the modern comfort in a timeless surrounding. 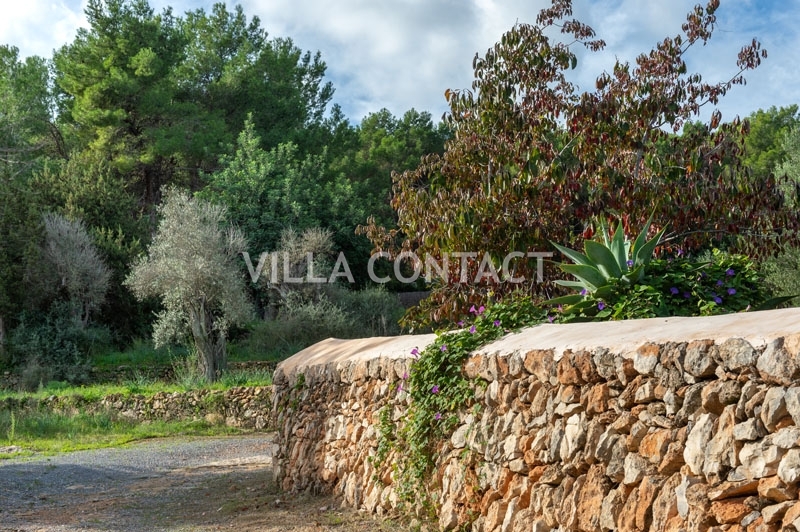 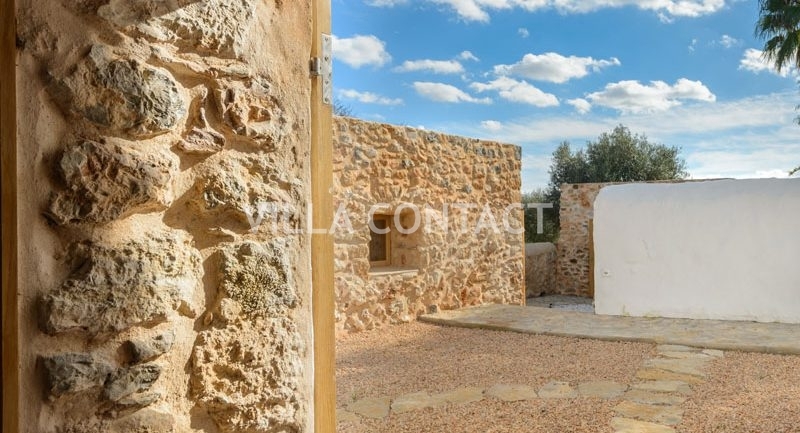 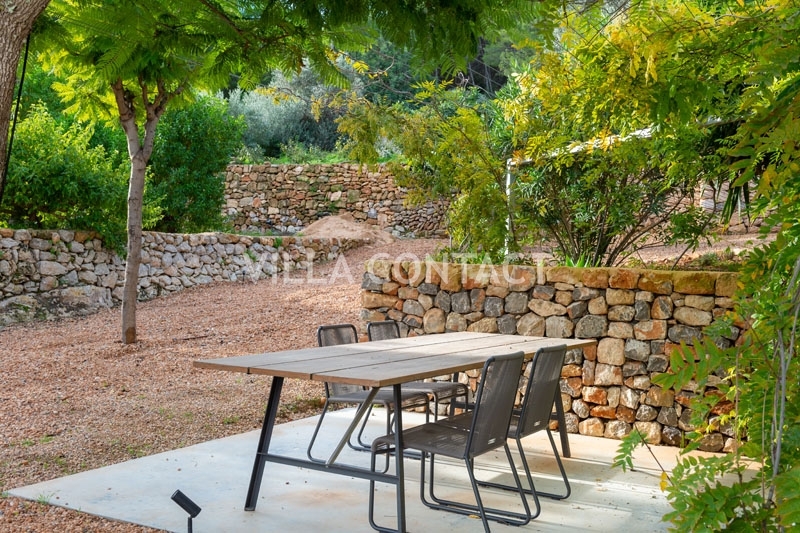 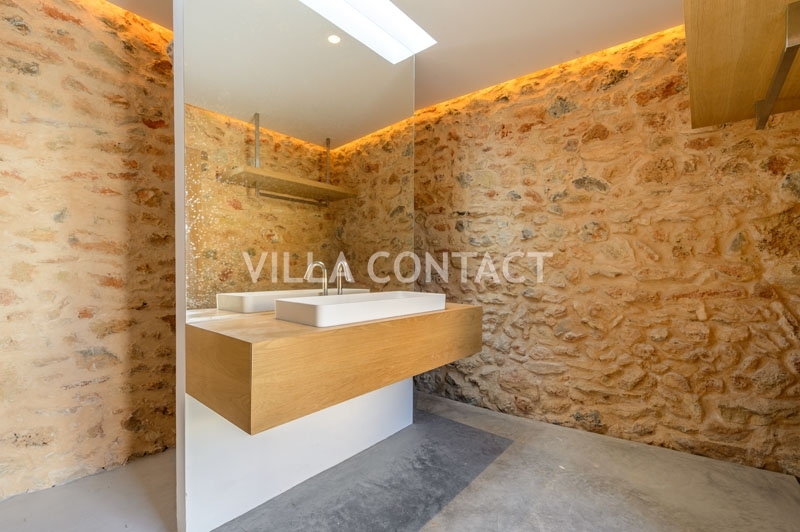 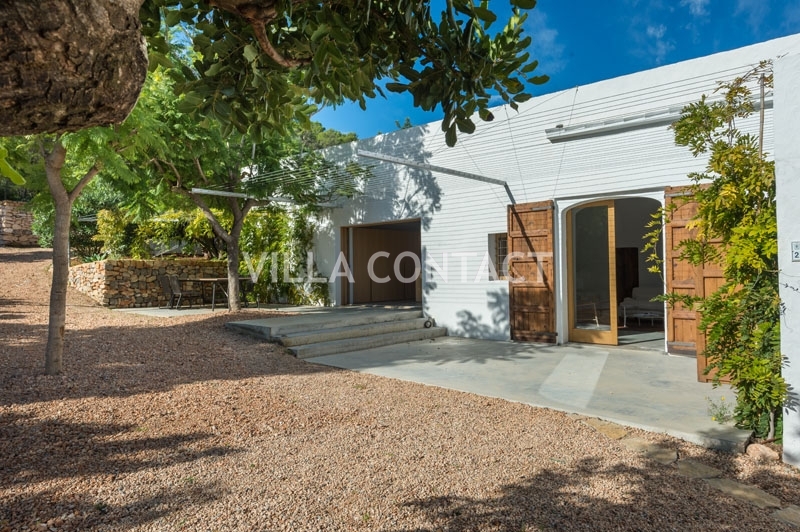 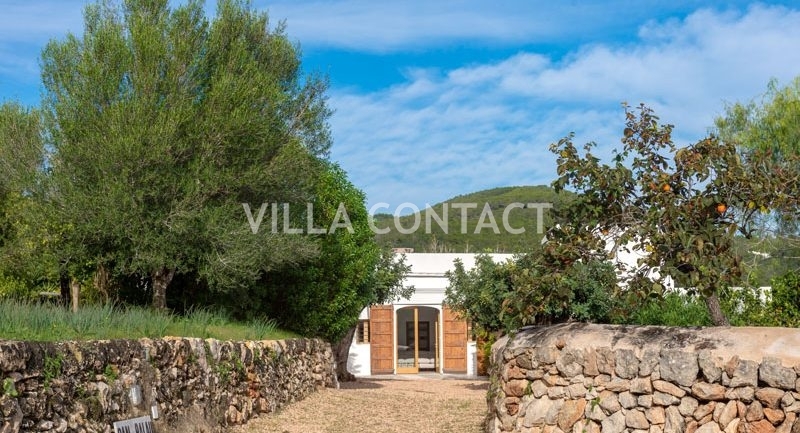 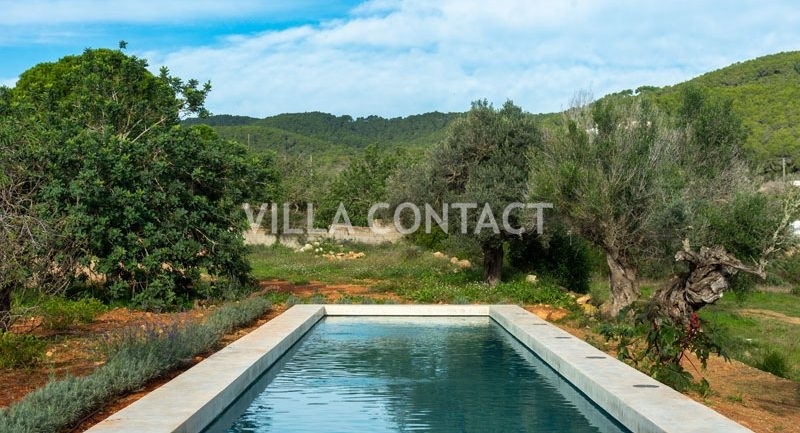 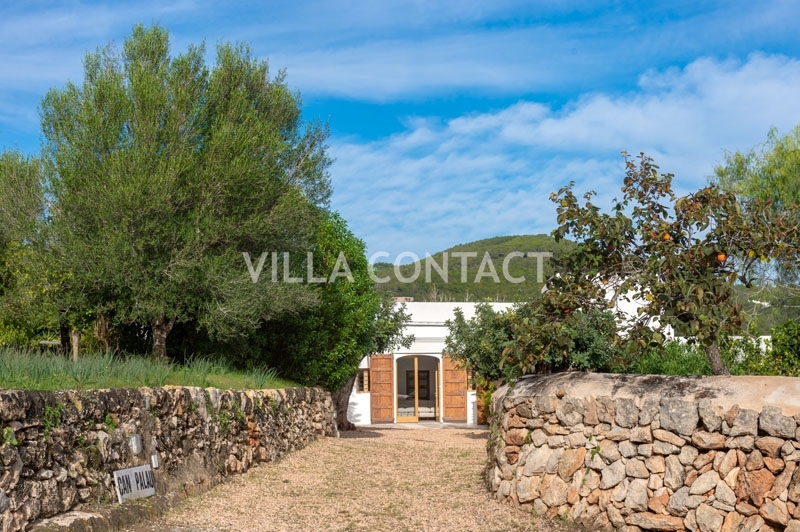 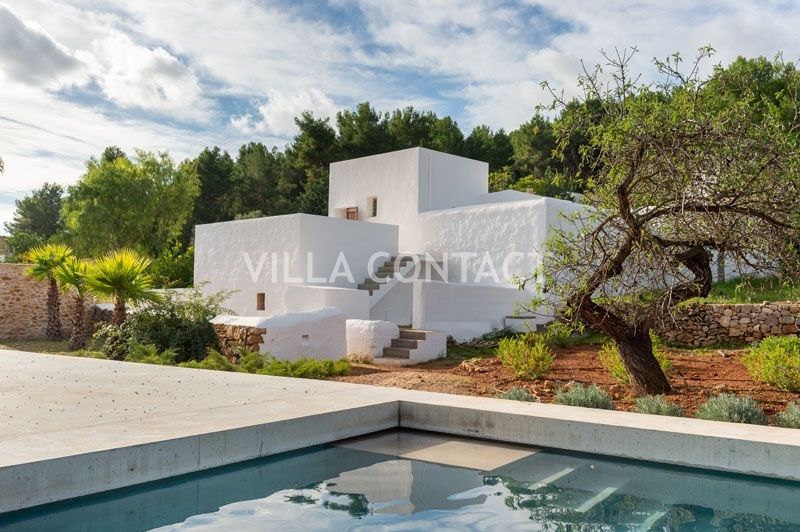 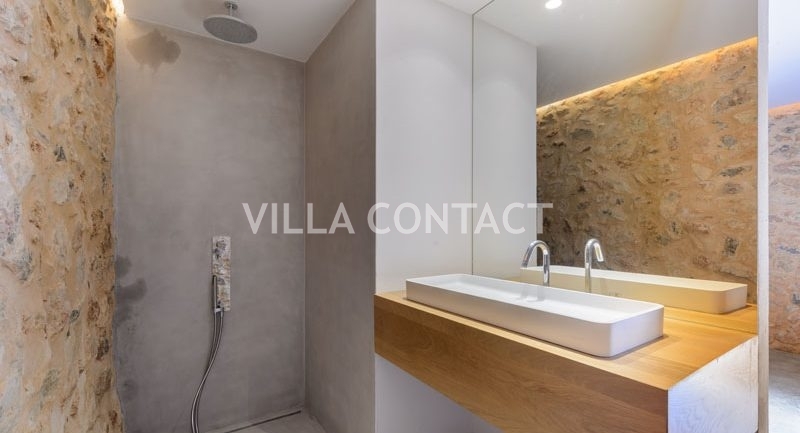 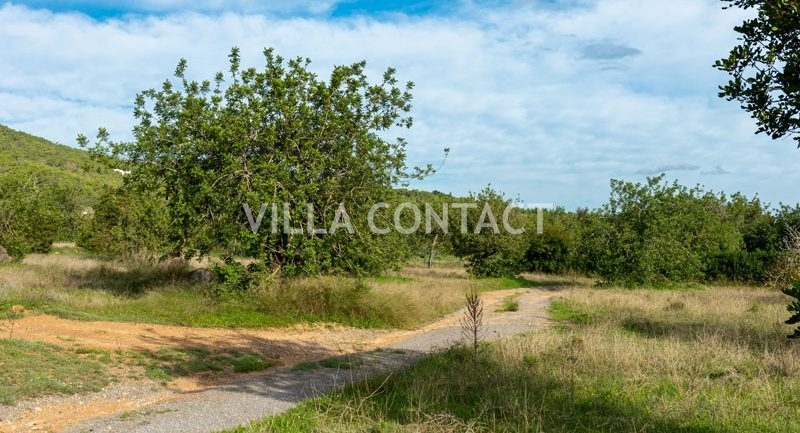 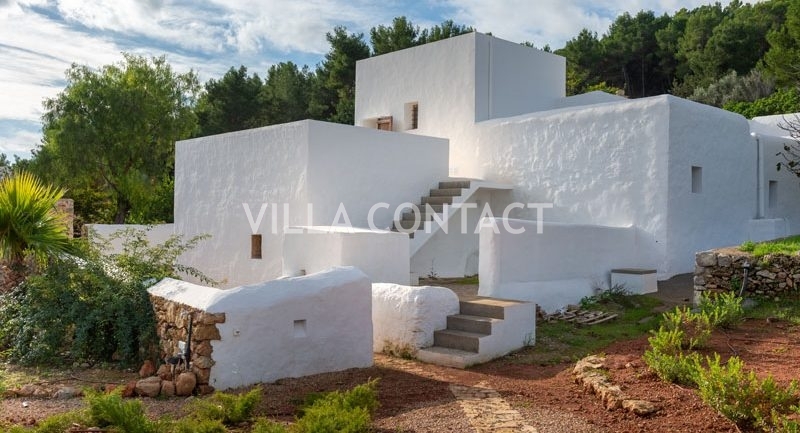 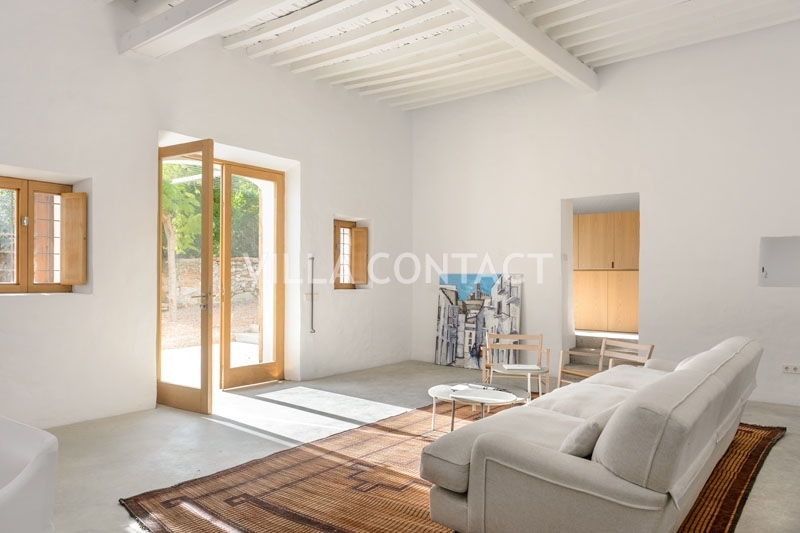 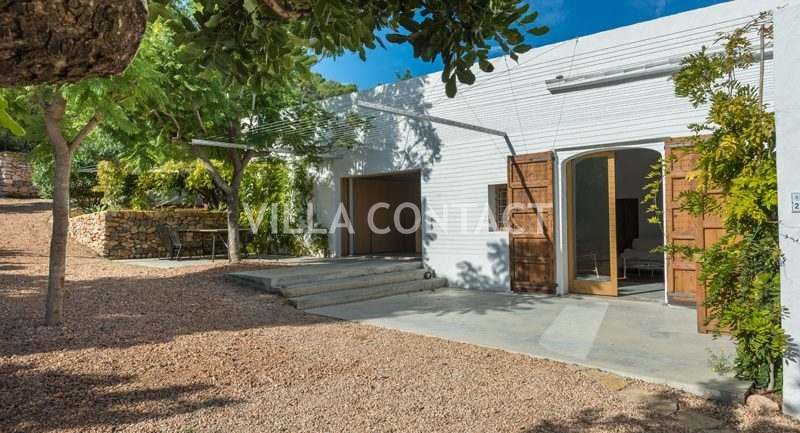 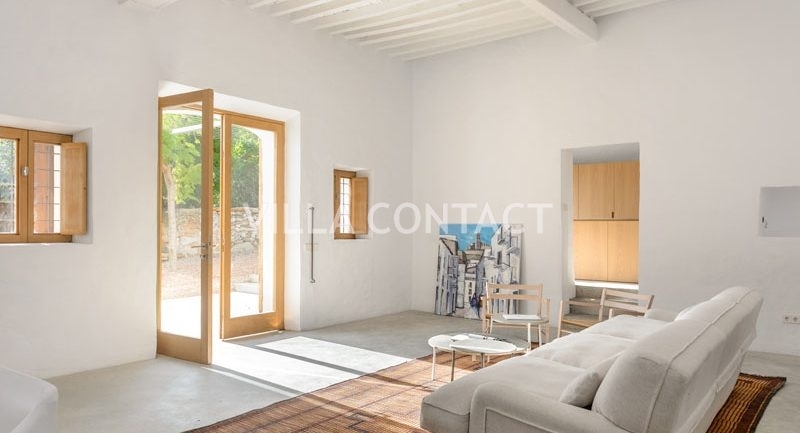 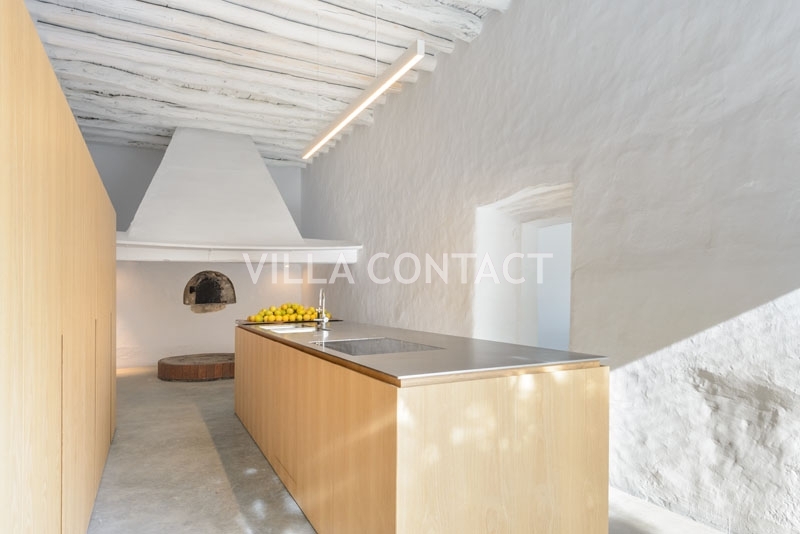 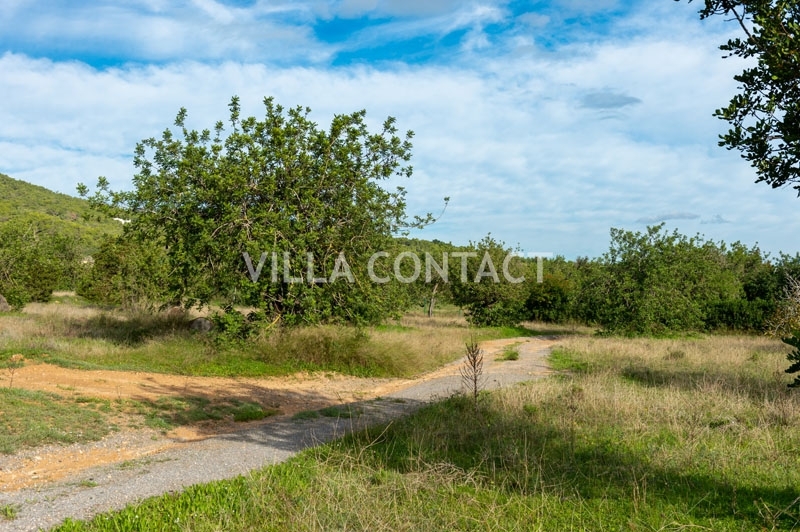 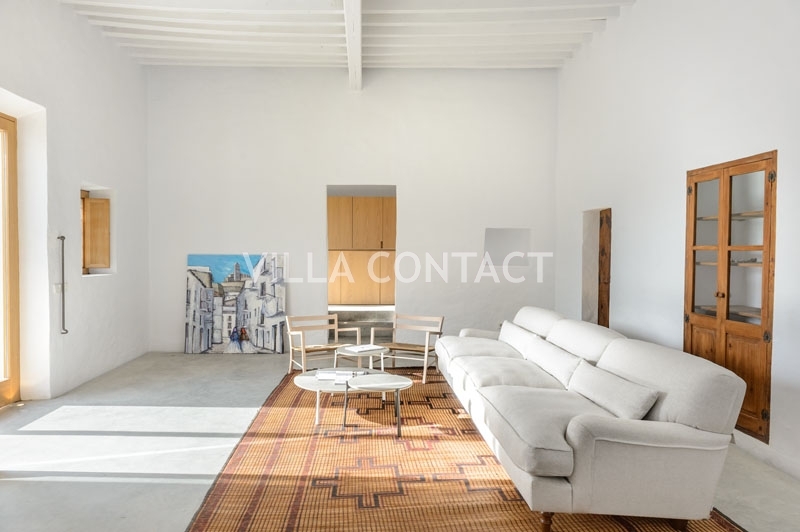 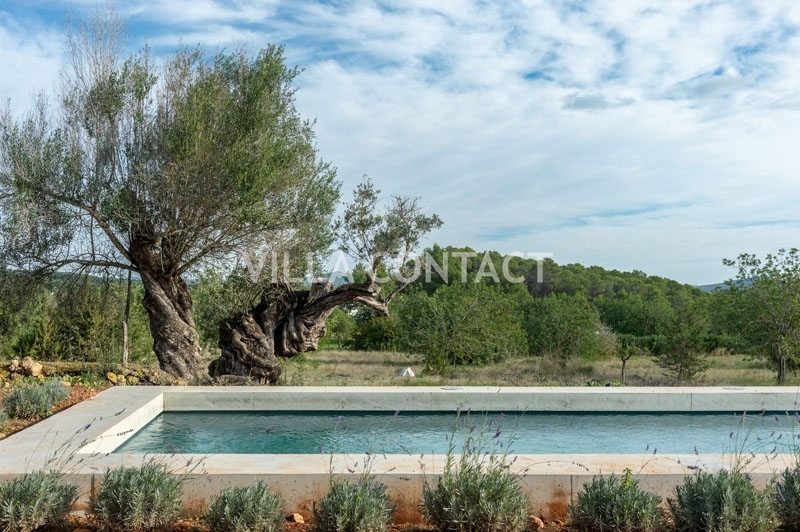 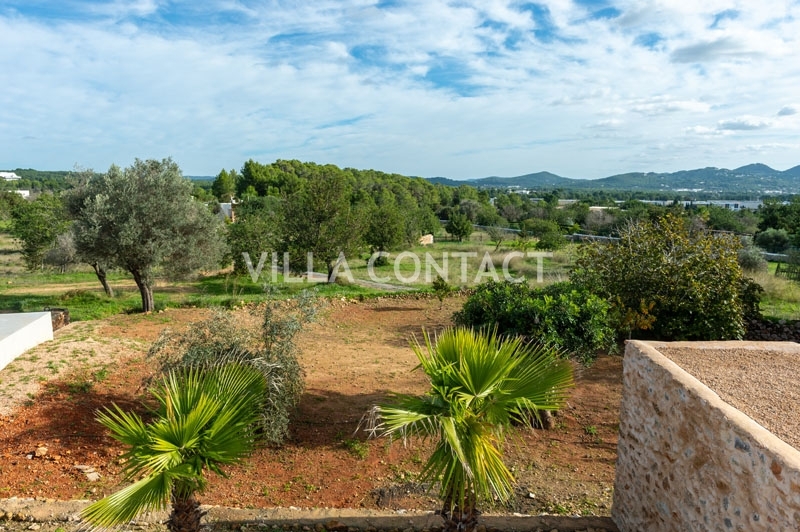 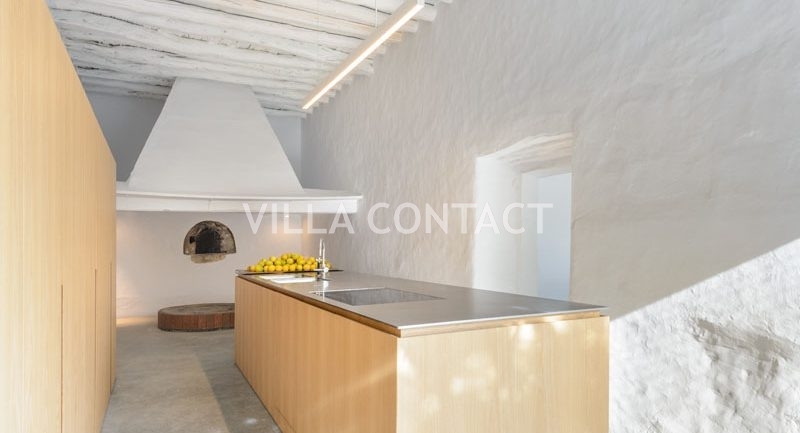 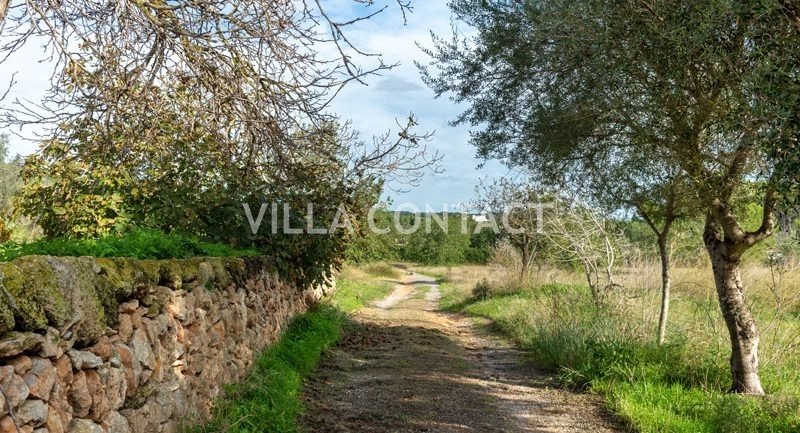 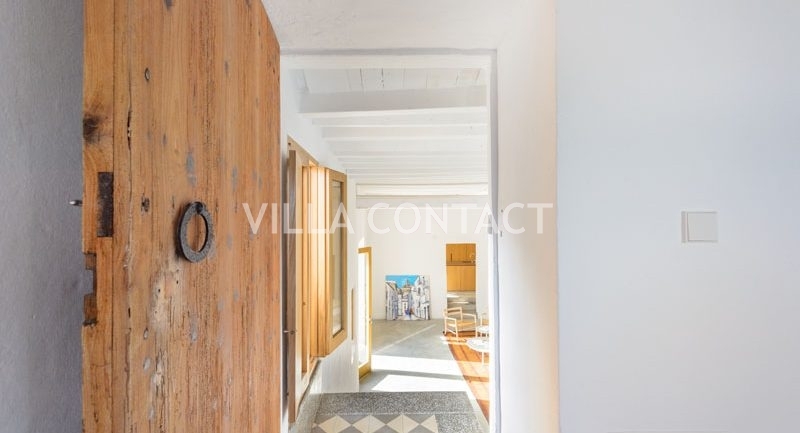 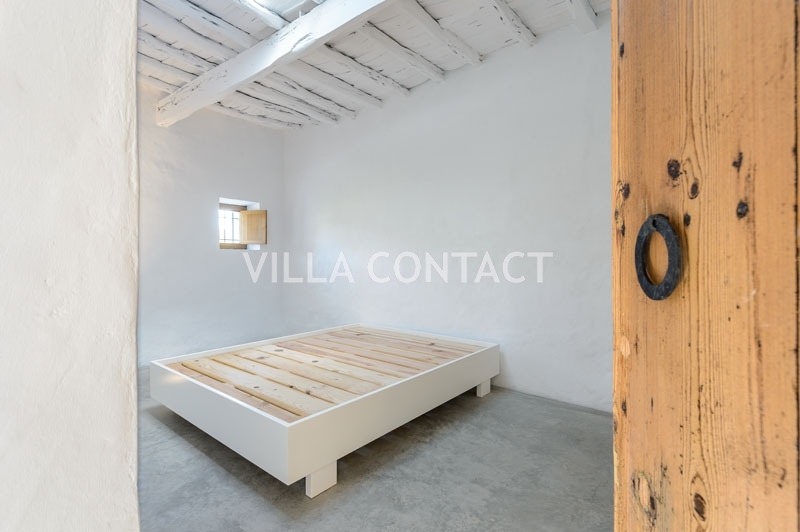 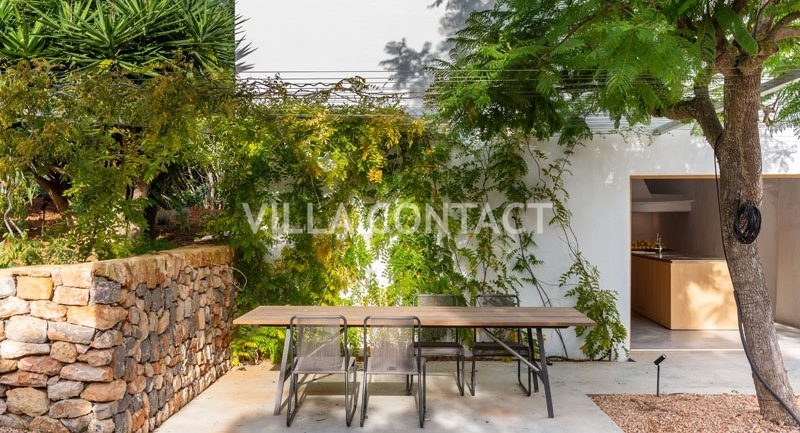 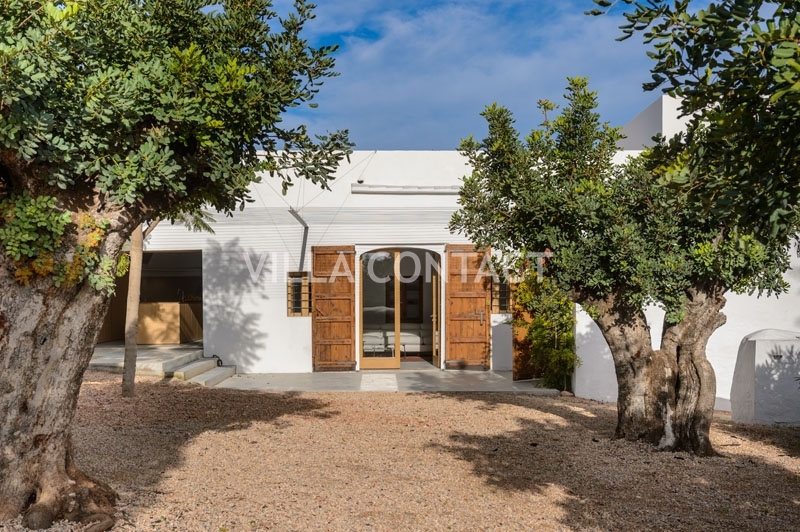 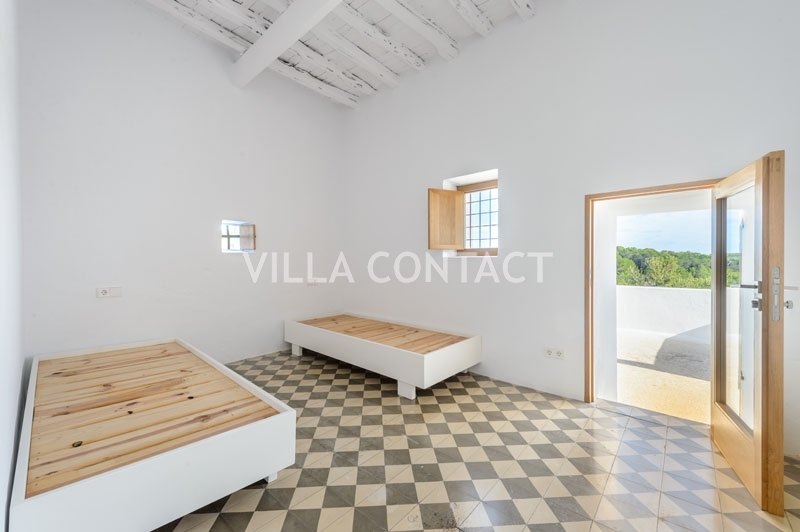 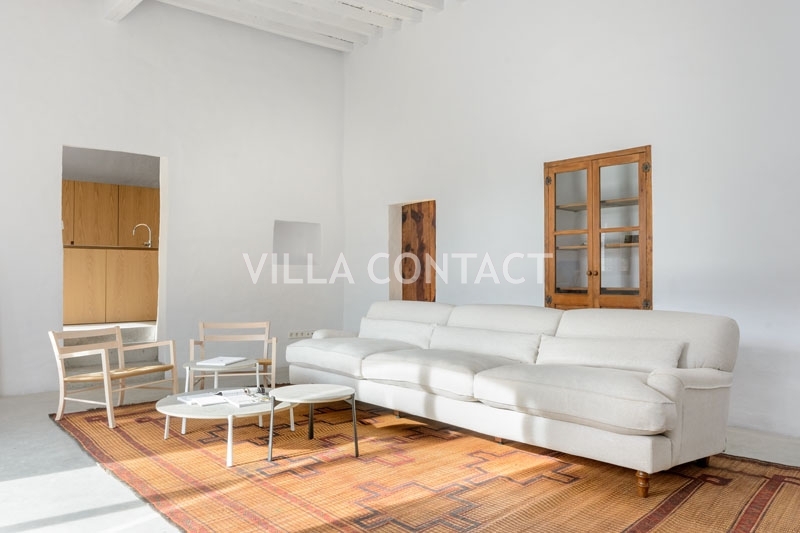 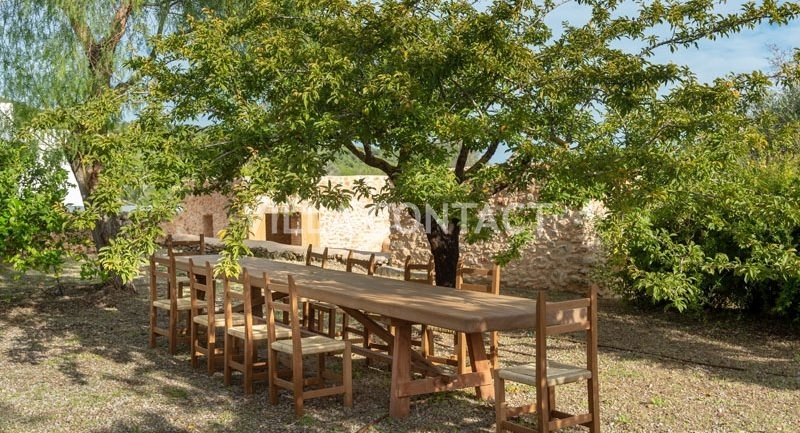 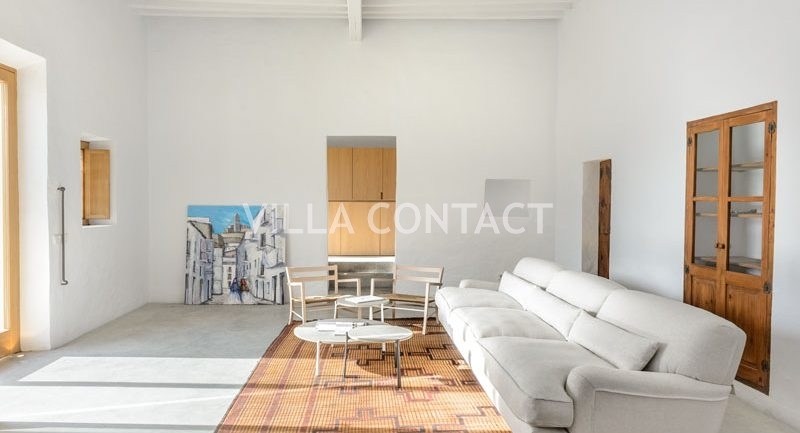 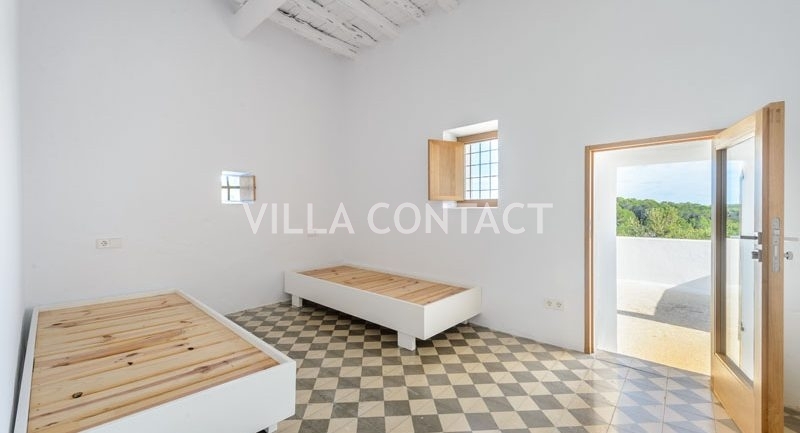 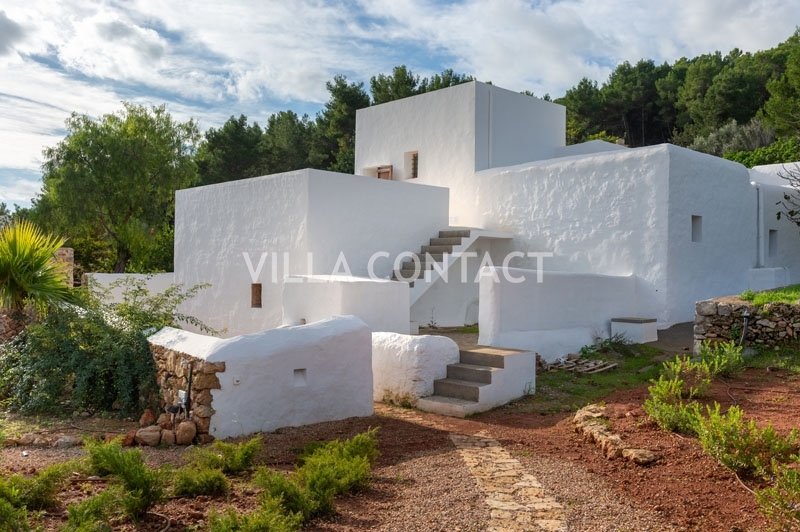 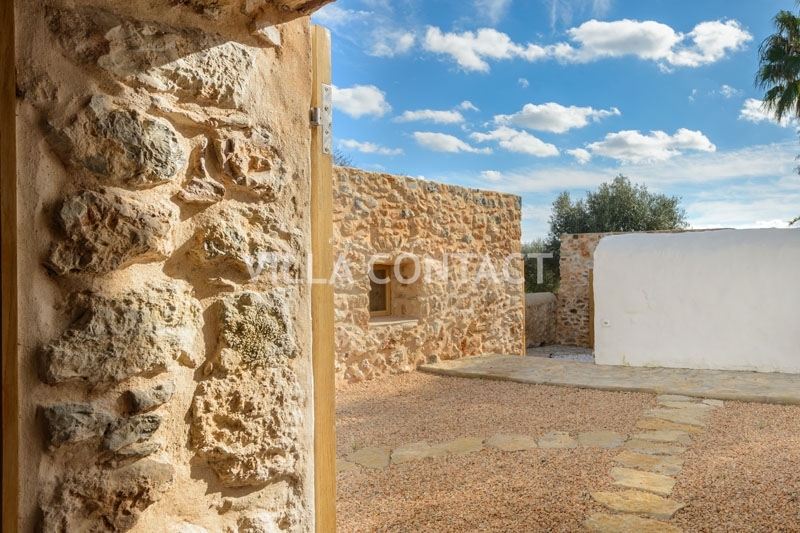 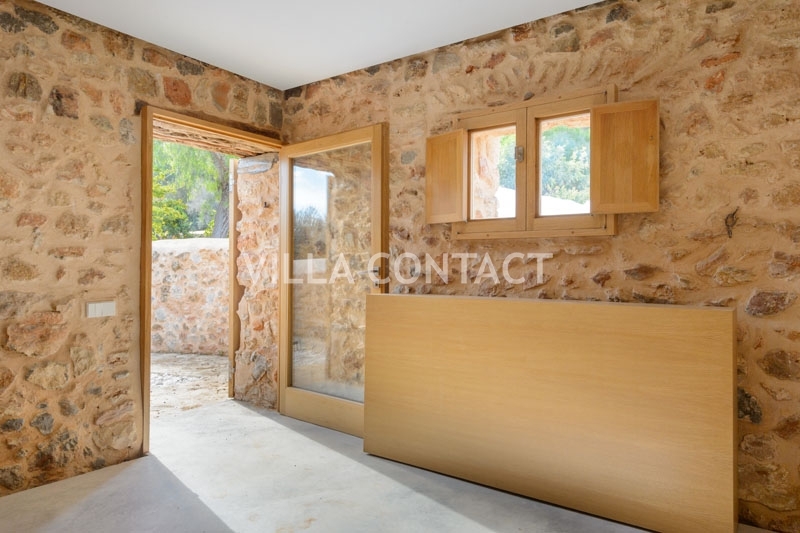 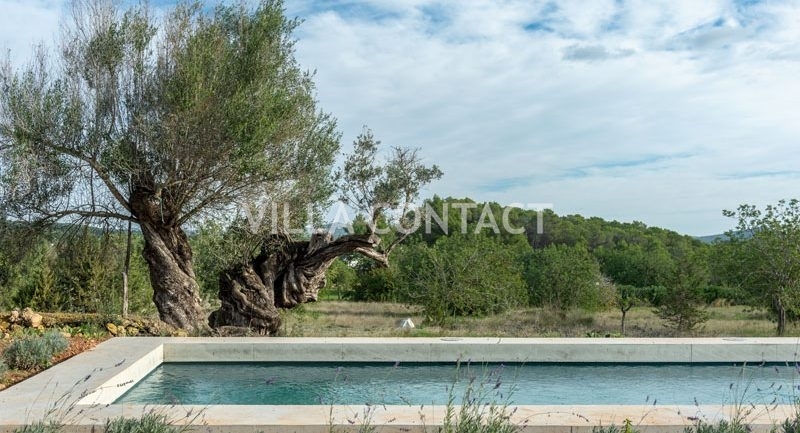 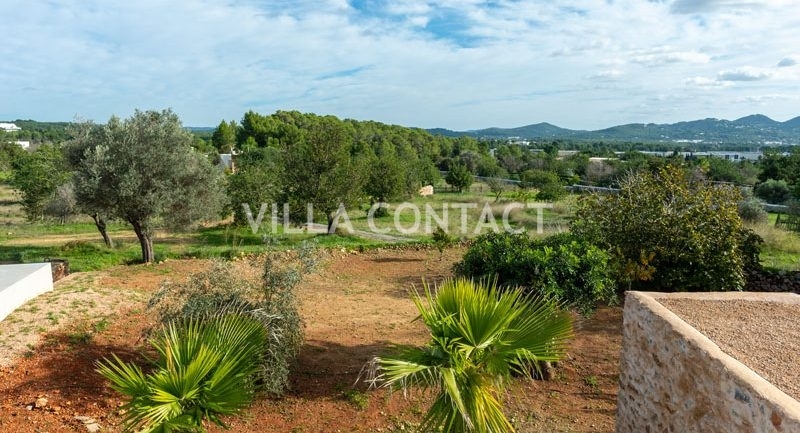 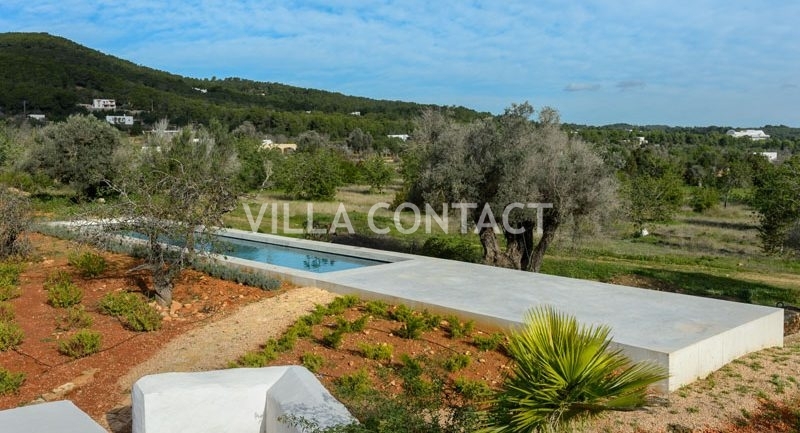 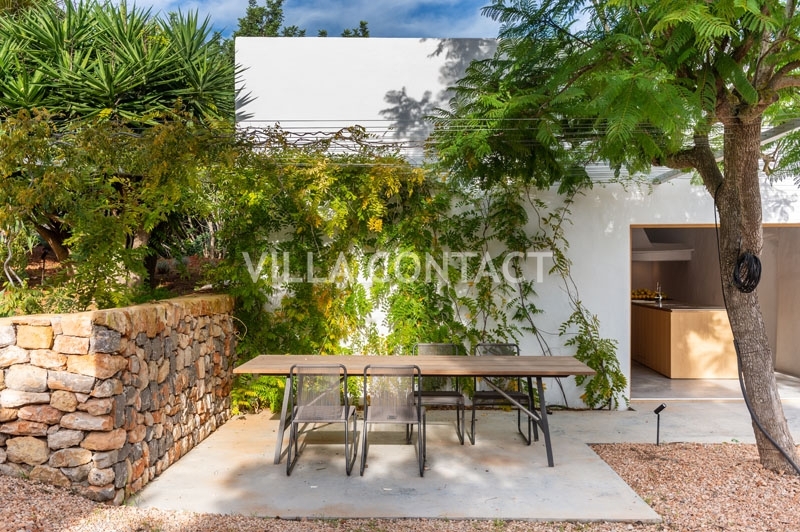 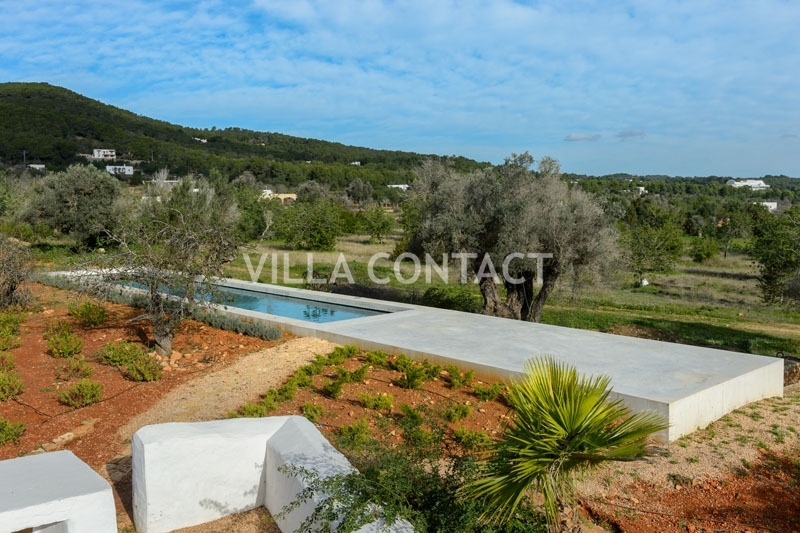 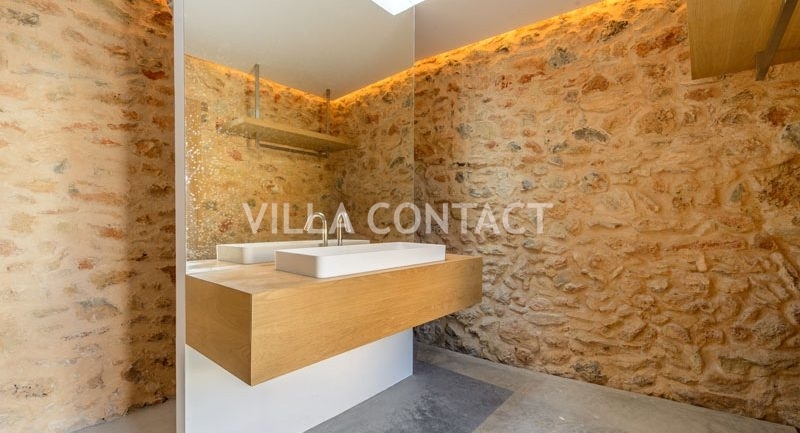 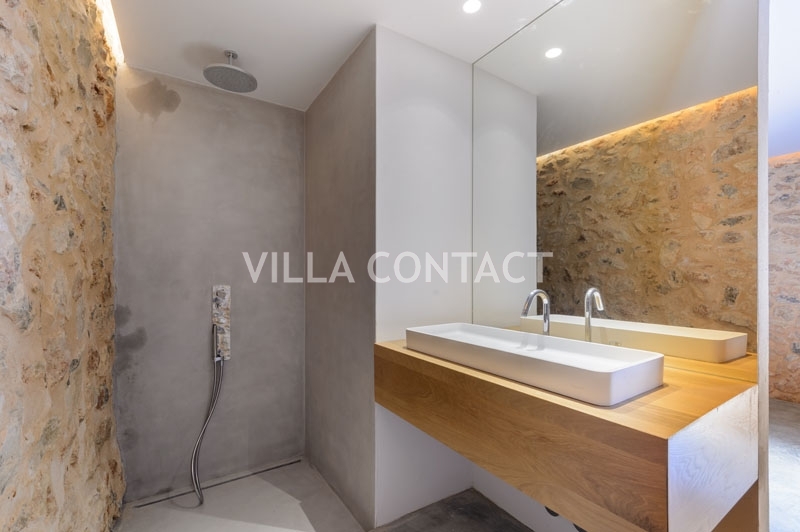 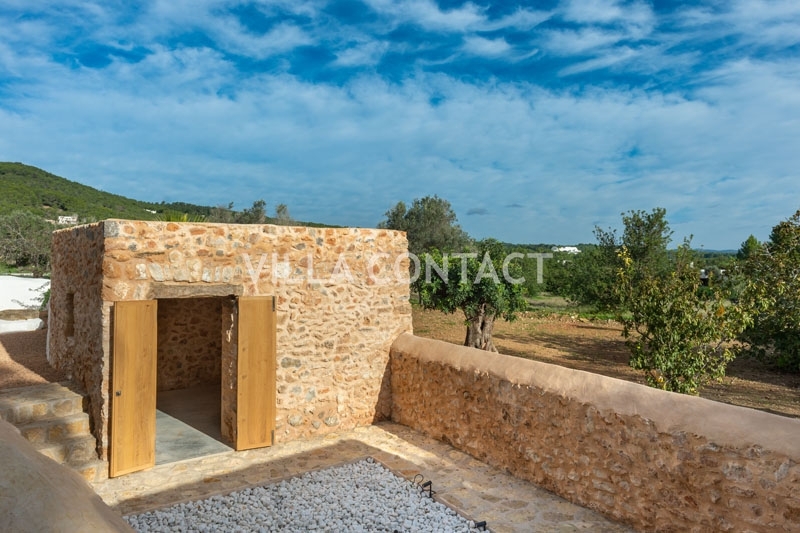 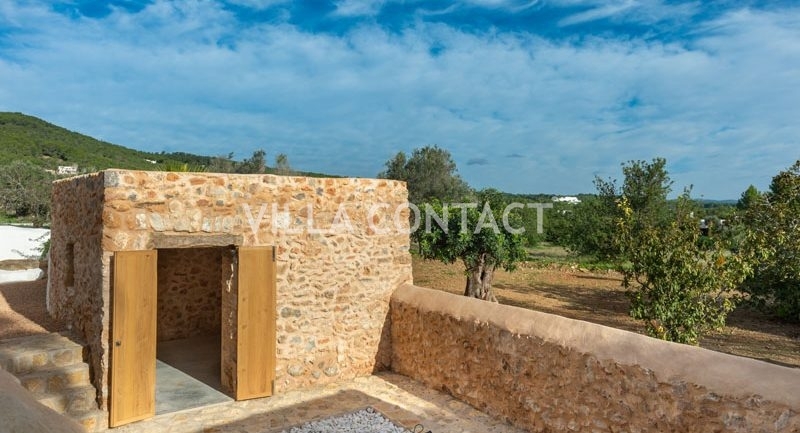 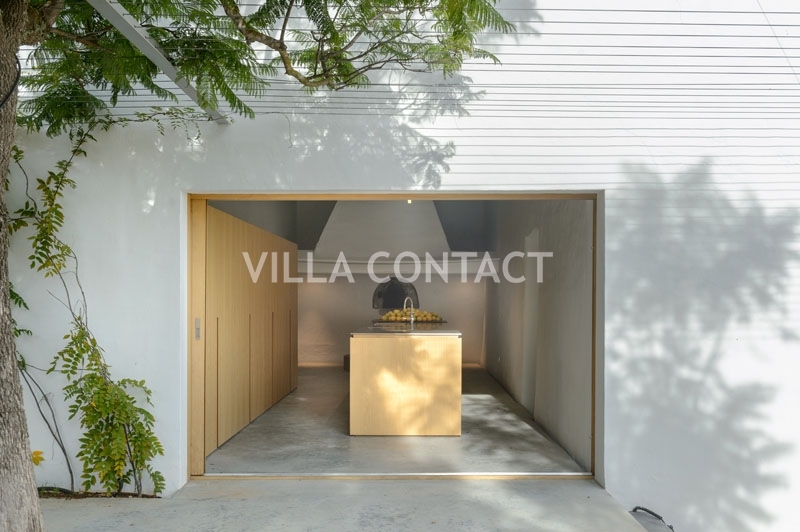 521 m2 build on a 18,628 M2 land, the house offers a large double height living room, a modern kitchen beside an old and authentic fire place where “one can sit in”, 5 bedrooms + 1 dormitory and 6 bathrooms. 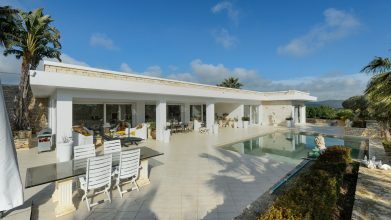 The house is white. 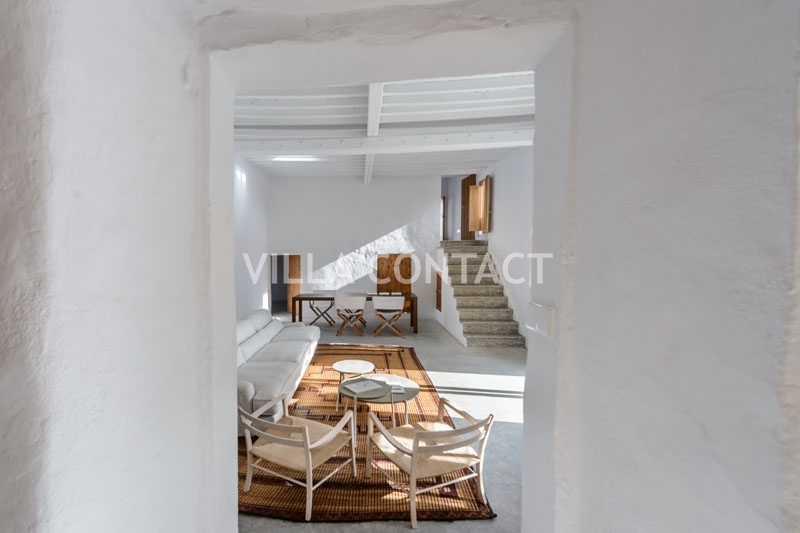 Vertically, the old walls show proudly their old character, whereas, horizontally, the ground in poly concrete and the some modern false ceilings set them their precision. 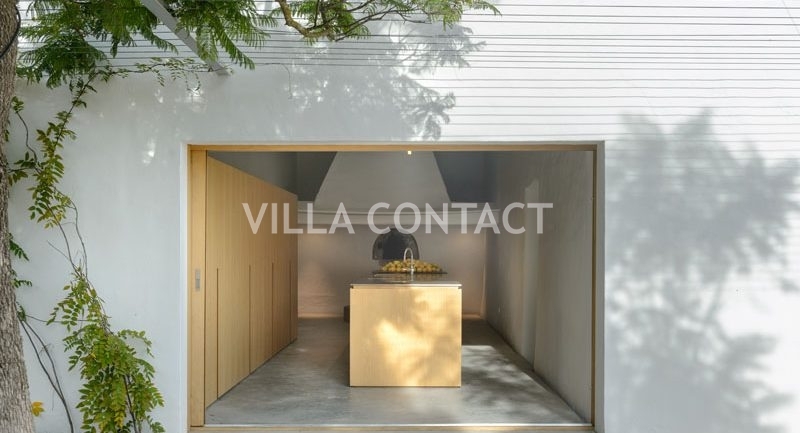 In the garden, almond and pluri-century trees, a double stone volume shelters a room around a private patio. 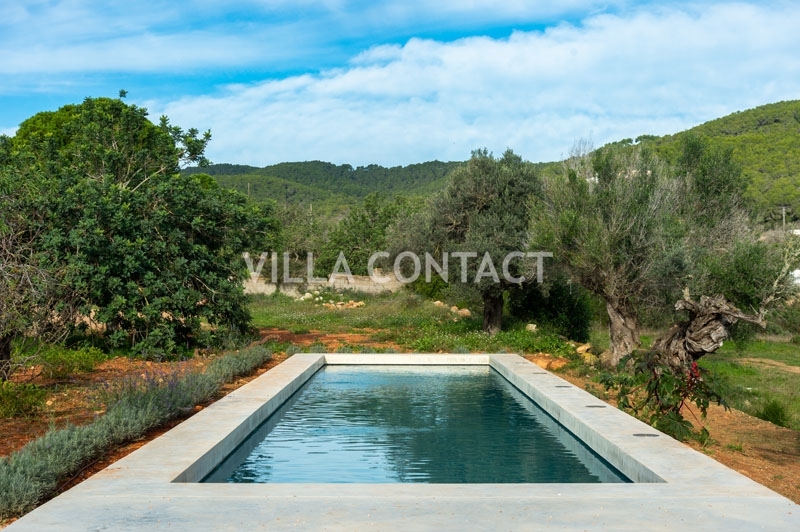 Further, a large swimming pool build in a massive concrete tank punctuates the garden. 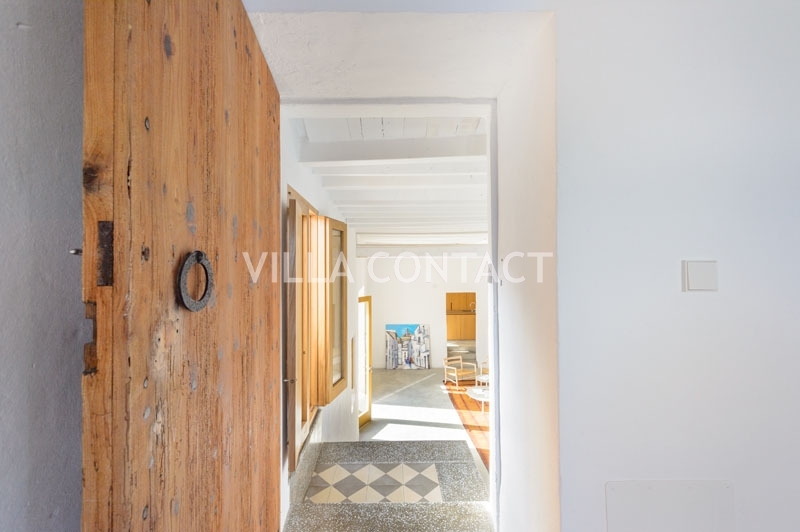 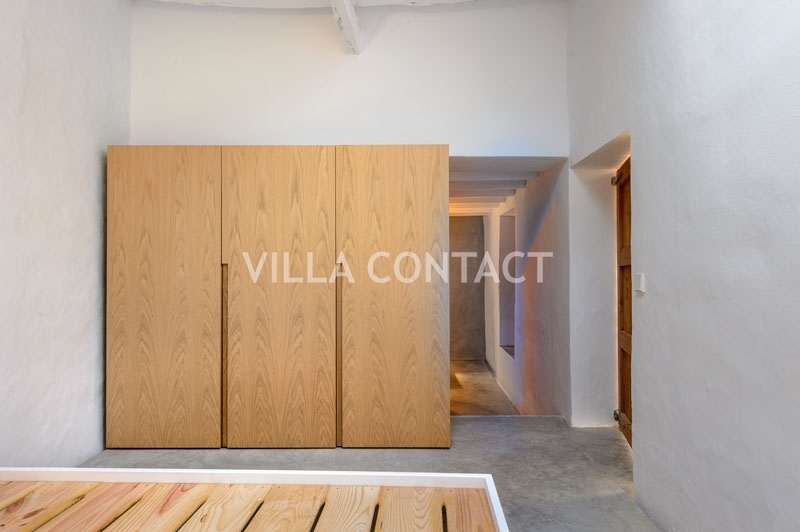 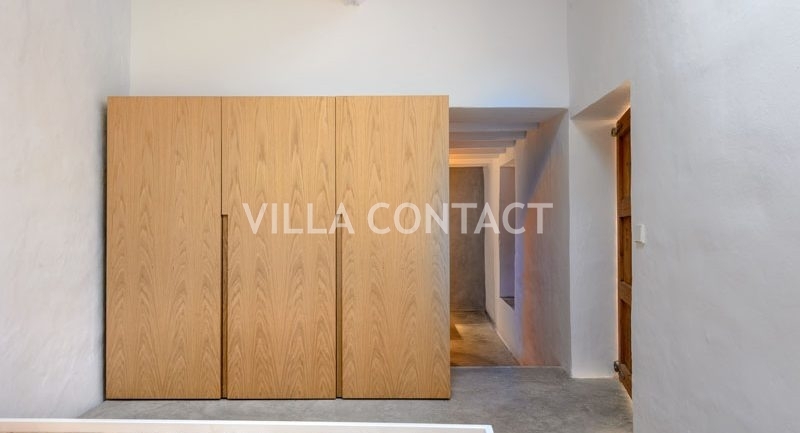 Some nice old wooden doors have been maintained and renovated, the joinery is made of deep veneer of oak. 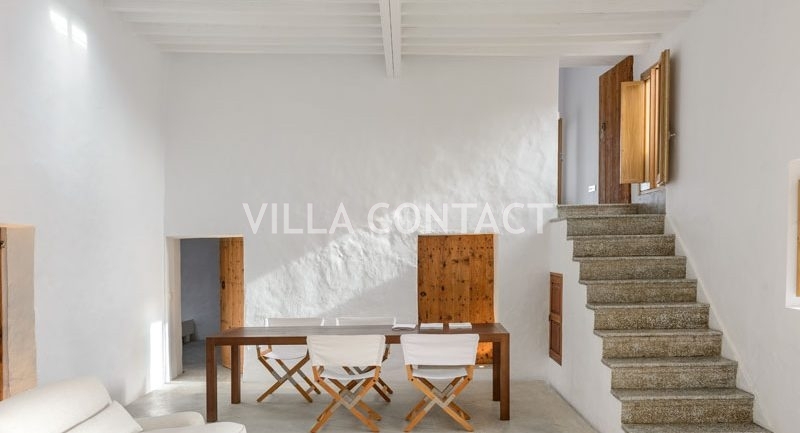 The opposition between ancestral and modernity appears as a revelation which qualifies the place. 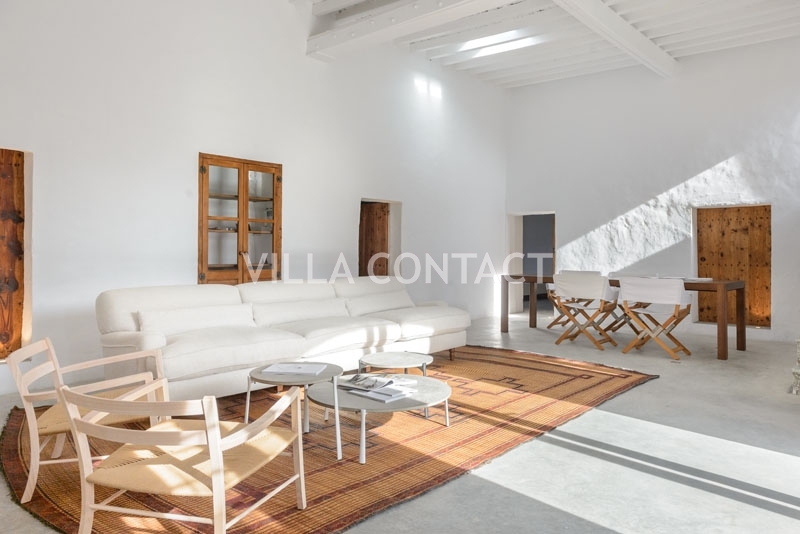 Driven by Bruno Erpicum, the well known Belgium Architect, the renovation considers the nature as “an integral component of the project”. 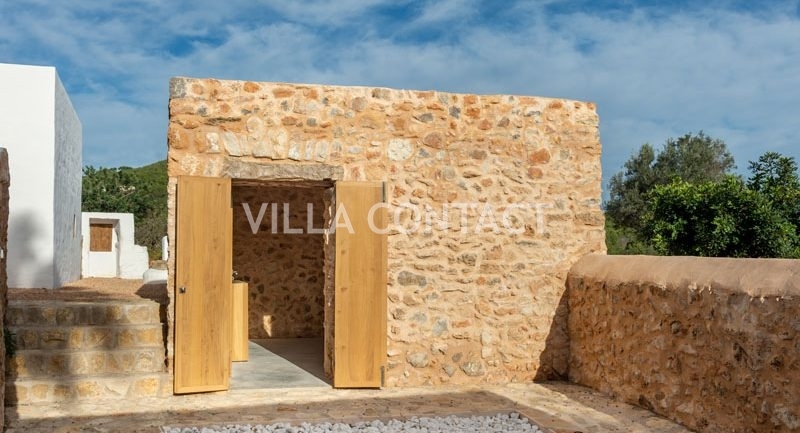 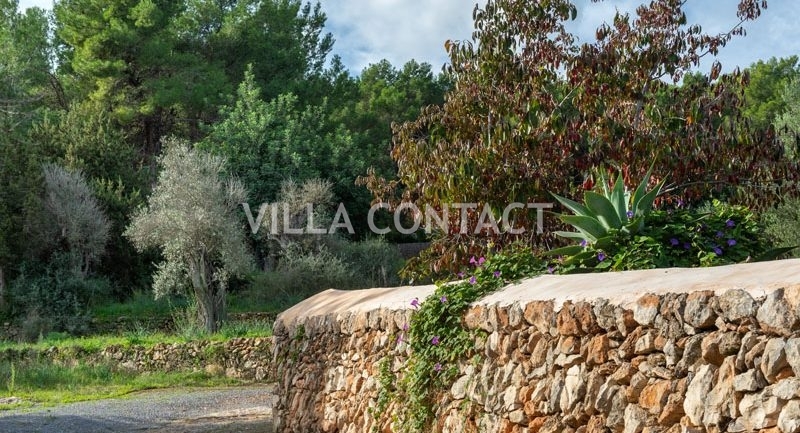 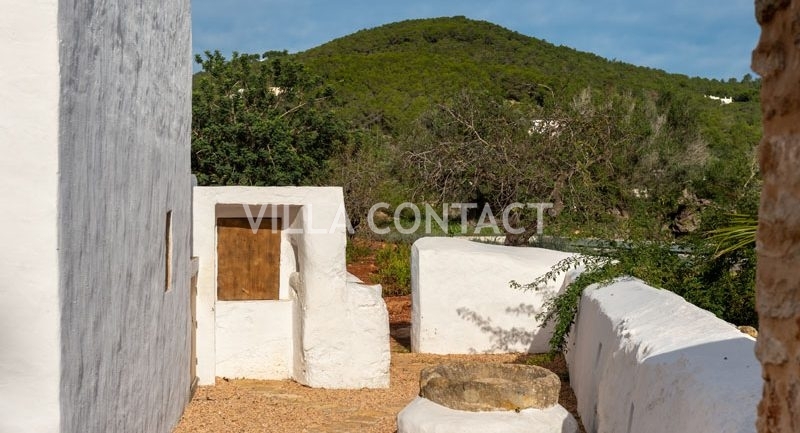 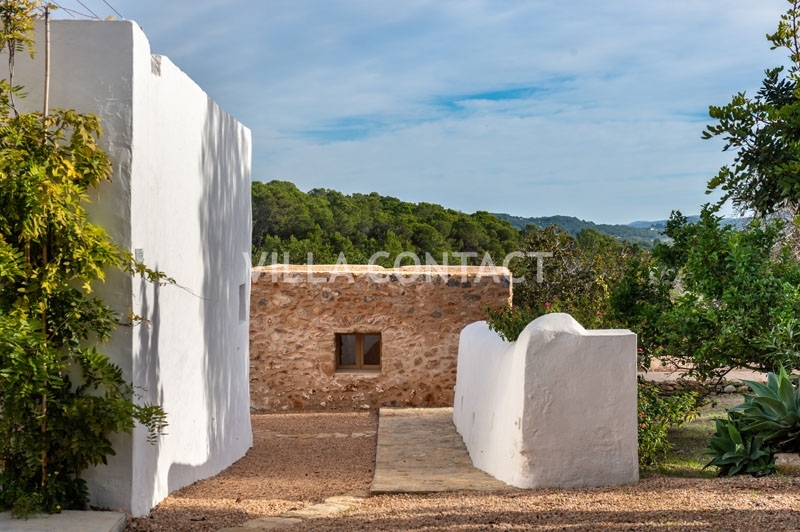 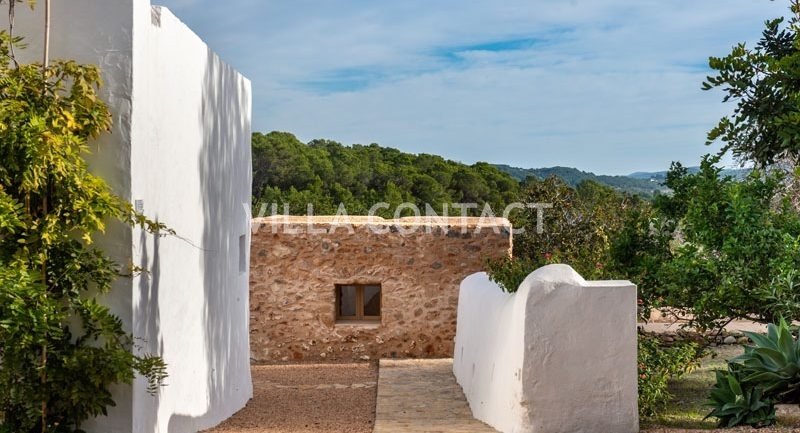 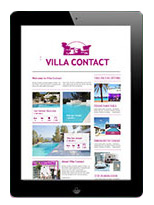 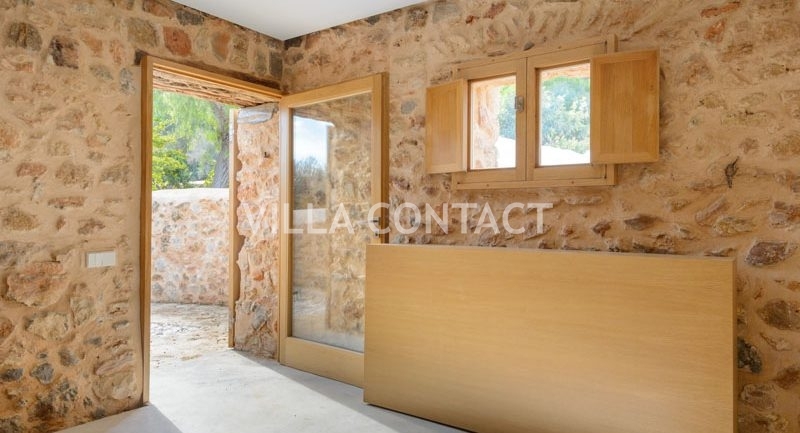 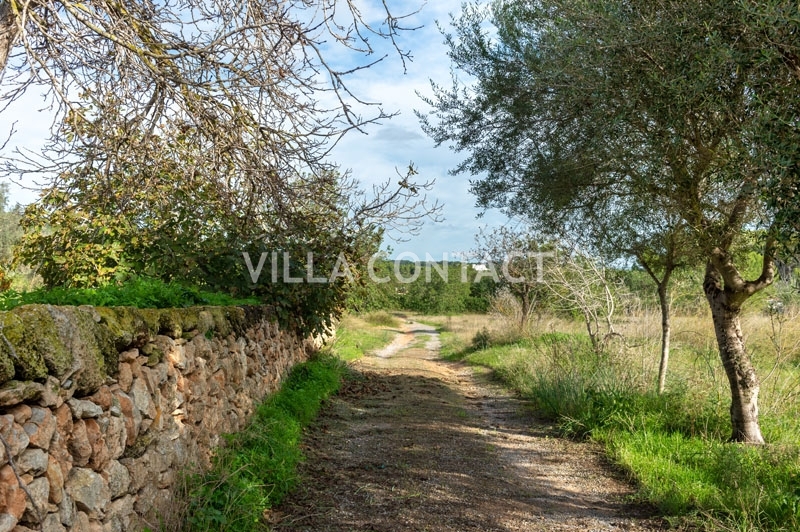 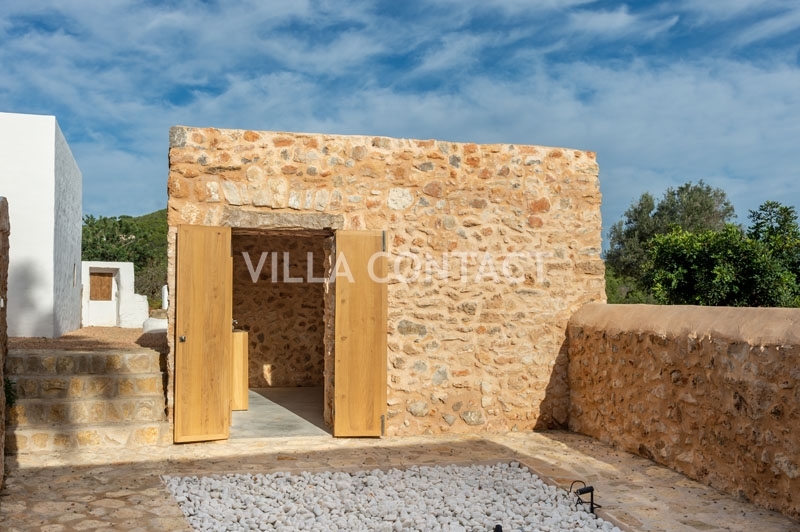 Close the village Sant Rafel de Forca, Termino Municipal de Sant Antoni de Portmany, the finca CAN PALAU was erected in 1890 in the Balearic Countryside, at 15 minutes from Ibiza Town and its harbour, at 20 minutes from the airport.